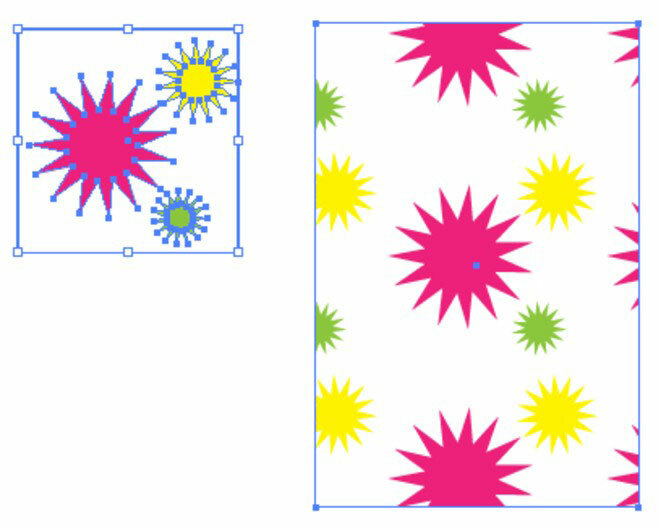 Using patterns in Adobe Illustrator CS6 can be as simple or as complicated as you want. If you become familiar with the basic concepts, you can take off in all sorts of creative directions. To build a simple pattern, start by creating the artwork you want to use as a pattern on your artboard — polka dots, smiley faces, wavy lines or whatever. Then select all components of the pattern and drag them to the Swatches panel. That’s it — you made a pattern! Use the pattern by selecting it as the fill or stroke of an object. You can’t use patterns in artwork that will then be saved as a pattern. If you have a pattern in your artwork and try to drag it into the Swatches panel, Illustrator kicks it back out with no error message. On a good note, you can drag text directly into the Swatches panel to become a pattern. Click the pattern swatch in the Swatches panel and drag it to the artboard. Deselect the pattern and use the Direct Selection make changes to the pattern. Keep making changes until you’re happy with the result. To update the pattern with your new edited version, use the Selection tool to select all pattern elements and Alt+drag (Windows) or Option+drag (Mac) the new pattern over the existing pattern swatch in the Swatches panel. When a black border appears around the existing pattern, release the mouse button. All instances of the pattern in your illustration are updated. To add some space between tiles, create a bounding box by drawing a rectangle shape with no fill or stroke (representing the repeat you want to create). Send the rectangle behind the other objects in the pattern and drag all objects, including the bounding box, to the Swatches panel. To scale a pattern, but not the object it’s filling, double-click the Scale tool, shown in the margin. In the Scale dialog box that appears, type the value that you want to scale and deselect all options except Transform Patterns. This method works for the Rotate tool as well.